I don’t know the origin of this recipe and I’ve tweaked it a little over the years. The original was a plain brownie, no chips or nuts. It’s one of those handed down by Grandma Mary to Mom to me. It’s probably another recipe that got clipped from a weekly newspaper’s food column or was found in a women’s magazine. The brownies are moist and even better if made a day in advance. Don’t cut them into squares until they are completely cool (I mean cold) or they crumble. 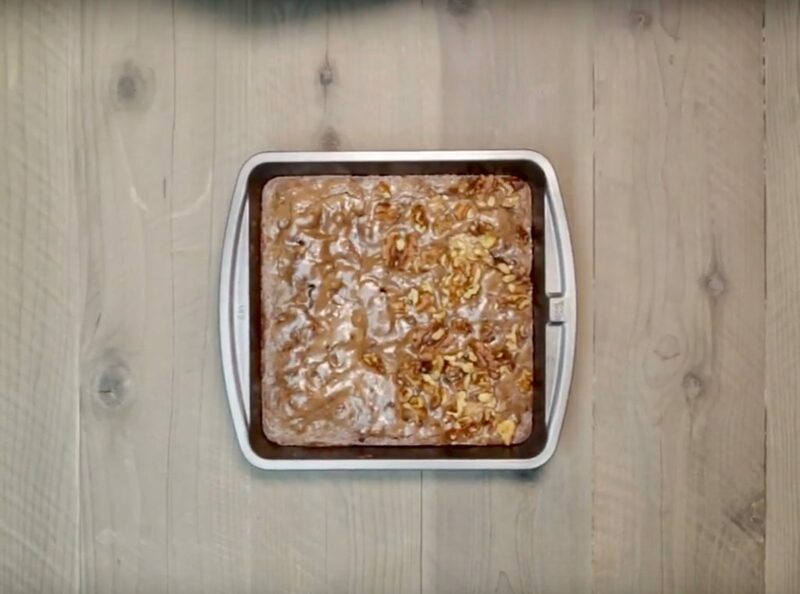 Use an 8” x 8” x 2” square pan, lightly greased and you’ll end up with 16 brownies. The nuts are optional and if you have a group that is divided over nuts, sprinkle some on half the top and all will be happy. These triple-chocolate brownies are quick and easy to make and a real crowd pleaser. Don’t hesitate to serve with a scoop of ice cream on the side! 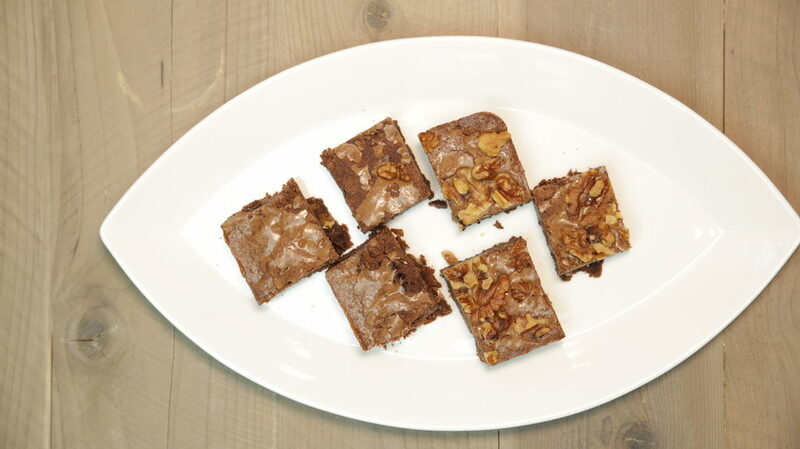 Watch the Triple-Chocolate Brownies Video here. Brownies are an all-time favorite and these triple- chocolate brownies bring three times the flavor! Quick and easy to prepare. Lightly grease an 8-inch by 8-inch by 2-inch baking pan. Place the butter and chocolate in a double boiler or microwave-safe bowl and melt over low heat, stirring occasionally. Once the butter is melted, take off heat to stir the chocolate to help it melt. Don’t let the mixture get too hot or the chocolate will seize. Stir in the sugar and vanilla extract, which helps cool the chocolate. Add eggs and vanilla and beat lightly. Beating too hard will incorporate air and create a less dense brownie. Stir in the flour mixing until all the flour has been incorporated. Stir in the chips and nuts, if using, until thoroughly blended. Spread mixture into the greased baking pan. Top the brownie batter with the walnuts, if desired. Bake in preheated oven for 25 minutes; the brownies are done when top looks cracked and the sides have pulled away slightly. A toothpick inserted in the middle should show a moist crumb. Fantastic!!! Didn’t bake quite as long because Jerry loves ooey gooey brownies!! Delish Trish!!! This one’s a keeper!! Thanks! !